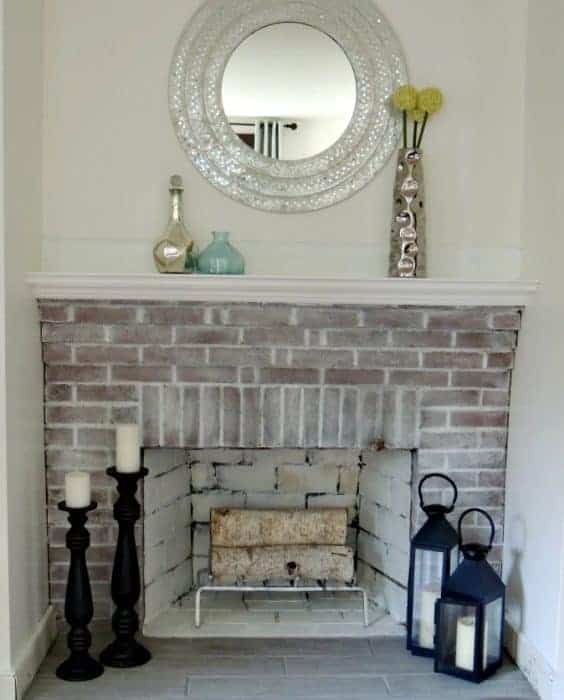 Remember waaaaay back when I whitewashed the fireplace and installed peel and stick tile for a fresh makeover? 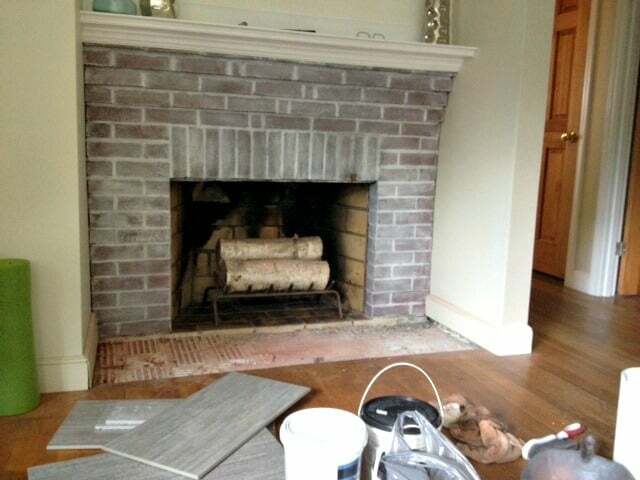 Well the smoke streaked hearth with the yellow brick has bothered me ever since. 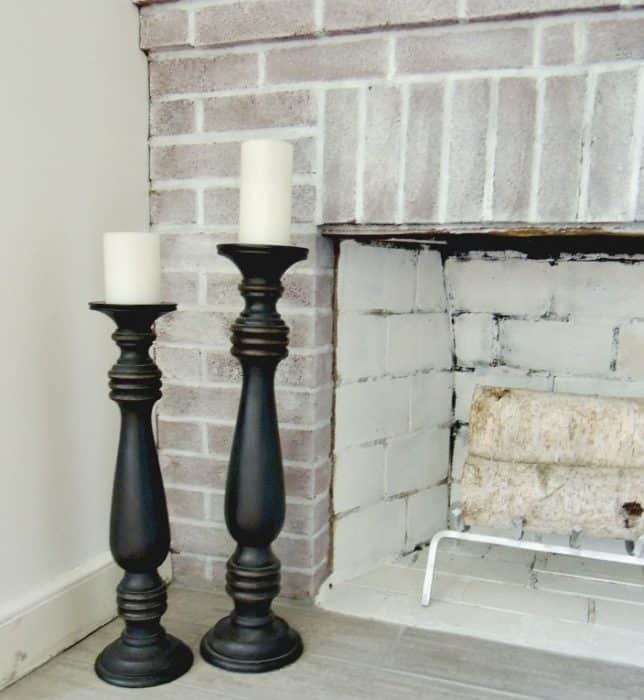 The fireplace itself hasn’t been used to burn a fire in decades but that soot would not budge no matter what type of product I used. Not only that, but after more than a year, the peel and stick tiles seemed to be losing their stickiness and were beginning to peel up at the edges and attract all sorts of dirt and lint. Not quite the look I was going for. I’ve wanted to replace the red brick tile hiding under those vinyl tiles for quite some time now, so this was of course the perfect opportunity. I’ve also felt a deep need for some dirty demo lately – must be my crazy pregnancy hormones! haha! Well, turns out that my demo skills are RUBBISH. The tiles were not stuck down with regular tiling mastik but concrete so it required A LOT of effort to knock/pull/smash them out. Lucky for me, I have a handsome, strong hubby to help with these things! Once all the tiles were removed and cleared out it quickly became obvious that the area being re-tiled was not even remotely level. In comes this wonder product. 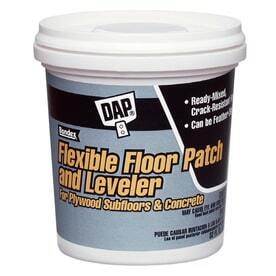 It’s flexible floor level that we picked up at Lowes along with all our other supplies for this project. All you do is spread it over the areas (nice and thick!) that you need to level out. You should check for level while you’re working. The best part is that once it’s dry (24 hours later) it’s still soft and flexible so you can adjust if need be. It won’t fully harden for a few days. Now for the fun part: the actual tile. We still have a bunch of porcelain tile left over from our bathroom remodel so that was the obvious choice for this project. It’s such a beautiful tile, I would gladly see it in several areas of my home! The tile itself is 12 x 24, which was much too large for this project, so Brian cut it down to plank sized tiles. I wanted three rows of tile (from back to front) so he figured out the correct dimensions by doing some math. If you are cutting tile down to size, don’t forget to include the space you’ll be leaving for grout. We chose 1/4 inch spacers so we included that measurement for each row. The next step was to stick it all down with tile adhesive. 24 hours later, once the adhesive had nicely set, I applied the grout. We chose a light grey to complement the tile. Once the grout was dry, the haze was wiped off to reveal my beautiful tile once more! 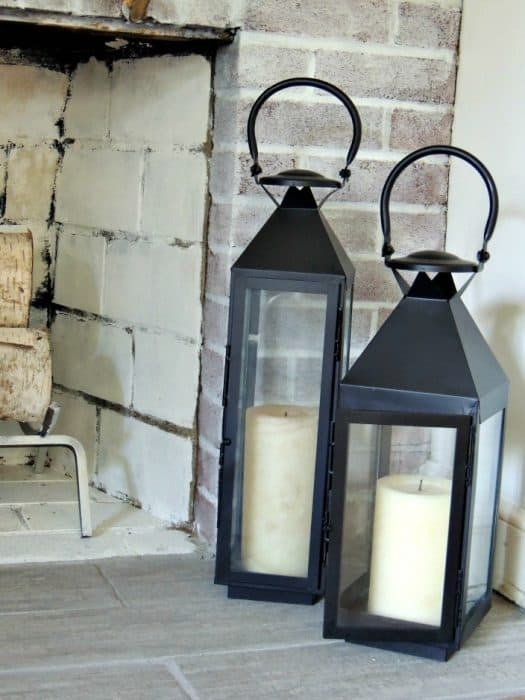 Dealing with the sooty mess inside the hearth is technically the easiest part. A couple of coats of primer and some white paint and it will be covered. Unfortunately, I ran out of primer after the first coat…so this project is not officially completed yet. Knowing me, it will remain in this unfinished state for some time yet! You can see where the first coat of primer didn’t cover but it kind of looks rustic and doesn’t bother me. Eventually once I finish the painting it will be opaque white. We are also going to install a raised threshold piece where the tile meets the hardwood. It currently looks a tad unfinished and we think this will be the perfect finishing touch! I’ll be back next week with a nursery update and baby gender reveal! Have a great weekend! I can’t see your pictures for some reason. Any suggestions?